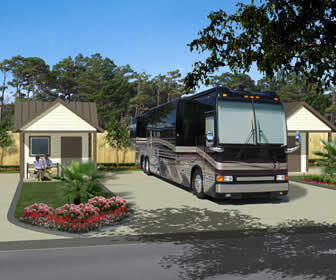 Exclusive luxury RV parks catering to the traveling big rig class A travelers only. The question has been brought up about the availability of luxury RV parks in Alaska and along the Alaska Highway. Many people are wondering if there are the full service RV parks like those they have become accustomed to in the lower 48 states with concrete pads, motorized carts, exclusive groomed spaces accommodating strictly to the Class A patrons. While there are no RV parks meeting these standards there are a few that incorporate only the highest standard of RV sites suited to today's traveling big rigs. While there really are no actual luxury RV resorts in Alaska, we do have some pretty fine parks to choose from. None are exclusive to big rigs but there are some that have priced themselves in a way that the smaller rigs will balk at spending the $70 or $80 per night to park there.